Ever since the famous 1984 cover of Time Magazine with two fried eggs and a frowning mouth of bacon, the egg has been wrongfully branded as the cause of high cholesterol and thus avoided, especially by the +40 segment. However, new research shows that eggs should be a much larger part of our diet, as they are rich in vitamins, minerals and nutrients that are beneficial to people. a number of vital vitamins and minerals and thus producing eggs with even higher levels of those vital nutrients – turning the regular egg into a functional food – but how to tell that story? Together Hedegaard and the Lab mapped out a number of different recipes for this natural egg-enhancement to suit different target groups of users. In this way we completely changed the dynamics of the category – no longer defining the different egg types by their production method (cage, free-going or Organic) but rather by the target group the egg was particularly suited for. The first result of this development was named Livskraft (The Force of Life) - an egg enhanced with minerals that strengthen eyesight, bone structure and other vital physical parameters especially vital for elderly people. 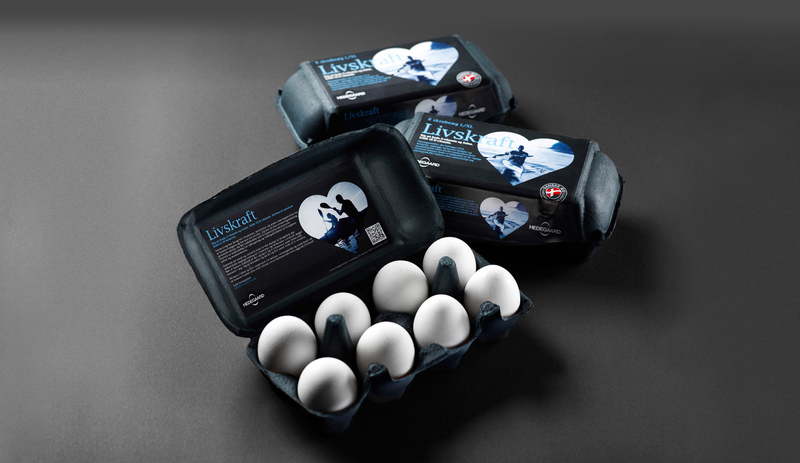 To emphasize that Livskraft is a whole new type of egg, the product was given a completely new identity and a distinctive name expressing the benefits of the egg rather than the method of production. The black tray stands out in the refrigerated counter, and the entire pack is used to communicate the story about Livskraft. Livskraft was launched in the first quarter of 2012, and the sales figures are beyond expectations.